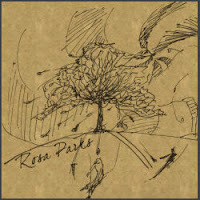 Rosa Park is a four-piece group hailing from Győr, Hungary. They took their name from Rosa Lee Parks, a civil rights activist who was born and lived in the U.S.
As Gergő wrote in his message, the band is inspired by underground clubs, friends, hunger, history of injustice, melancholic moments. Well done Gergő, well done Rosa Parks!! You see, the s key is beside the d key so she was alive again for a little while! !